Native Advertising: The Cure to Pop-Ups and Mobile Ad Blockers? As our world moves toward mobile-based technology, the Internet advertising community continues to take a hit. Though we occasionally see pop-up ads on desktops, ad blockers on laptops and mobile devices prevent such advertisements from coming up. This begs the question – in an increasingly mobile-based world, how are Internet advertisers to get around the barrier of mobile ad blockers? Pop-up ads are more of a nuisance than an effective advertising tactic. Today, people do not want to waste by clicking out of multiple advertisements to get to the information they are looking to read because, let’s face it, time is precious and ain’t nobody got time for pop-ups. At the end of the day, advertisers, companies, websites need to generate revenue in order for their business to stay afloat. So how can advertisers get around ad blockers and get away from pop-up ads? Simple. Native advertising. Native Advertising is a form of paid media where the ad experience follows the natural form and function of the user experience in which it is placed. Native ads match the visual design of the experience they live within. In simpler terms, native ads are used to engage site goers and provide interesting content without being so obvious about being an advertisement. Hubspot.com offers great examples of what native ads look like. Some fear native advertising will erode reader’s trust thereby driving down viewership. However, studies have shown that compared to banner ads, there is 10 times higher click through rate by using native advertising. The data of native advertising is promising enough to make any site or company reevaluate their Internet and mobile advertising tactics. 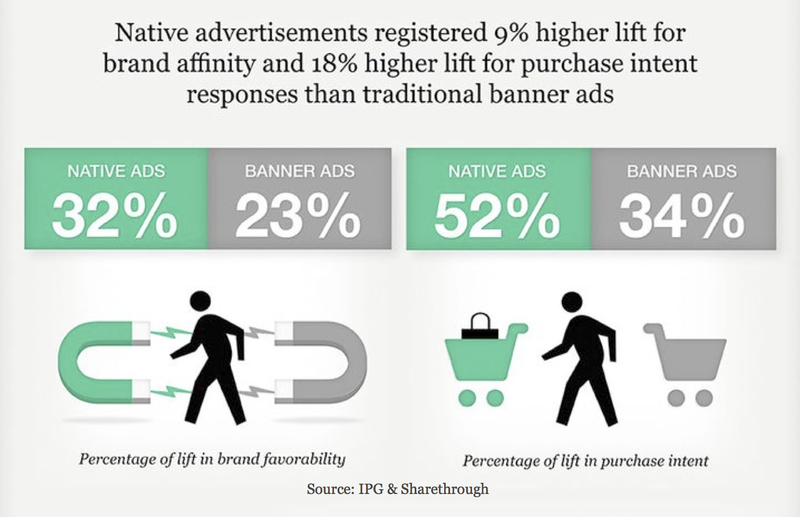 Using native advertising also creates and easy advertising “in” on mobile devices since the ad would be engraved into the site versus blocked by mobile ad blockers. Ethical or not, native advertising works and businesses are starting to evolve toward more user-friendly advertising. It is a way to get information out without disrupting user experience and offers helpful information in a format similar to its host site, which typically generates more user activity. This guest blog post was written by PRowl account executive Olivia Noble.